Even though more and more women are deciding to freeze their eggs, the subject is not talked about a lot and there is very little information available. Doctors also rarely bring it up, as it is considered a personal decision. We have therefore asked Dr Marta Devesa, from Dexeus Mujer's fertility preservation programme to talk to us about it. 1. Is there an age limit? Legally, there is no set limit, but it is recommended to do it before 37 years of age, as the quality of the eggs starts to deteriorate from that age. This doesn't mean that you cannot freeze your eggs between 37 and 39 years of age, but you need to be aware of your chances in each case. To find this out, ask to have your ovarian reserve tested. This can be determined with an ultrasound and a hormone test. In general, between €2,000 and €3,000. You will also have to pay an annual maintenance fee of around €300, although at some centres the cost includes the maintenance fee for the first few years. Always ask what is included. It might be for medical reasons, due to a health problem that could compromise your fertility, as happens in some types of cancer. But most women who freeze their eggs do so to have a reserve of high-quality eggs that increases their chances of having a child in the future, because they do not have a stable partner or feel that it is not yet the right time. 4. Could it have any negative effects on my health? It has no effect on your health or fertility. However, complications can occur, such as discomfort during the stimulation treatment or an infection following the puncture. 5. Is a minimum number of oocytes necessary in order to freeze them? With stimulation it is often possible to obtain between 10 and 20 eggs per menstrual cycle, which is considered the optimum amount. In general, 10 or more is considered sufficient, although this figure will depend on your age. 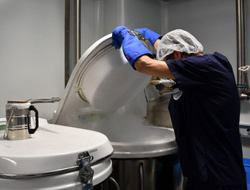 The older you are, the more oocytes we recommend freezing, as their quality can be compromised. 6. What is the success rate with frozen oocytes? In general, the pregnancy rate for embryo transfer using frozen oocytes is between 30% and 50% per cycle. However, results can vary depending on the technique used, the quality of the eggs, the patient's age when they are frozen and the specific characteristics of each case. 7. Do they have an "expiry date"? In theory they can be stored indefinitely. 8. What will happen to any I don't use? Before having the treatment, you will need to sign several documents that will explain the options available. You can decide whether, once you no longer need to use them, you want them to be destroyed, donated to somebody else (only possible if you are under 35 when they are frozen) or used in medical research projects.